FS: 1995 Miata w/torsen, rollbar, etc. 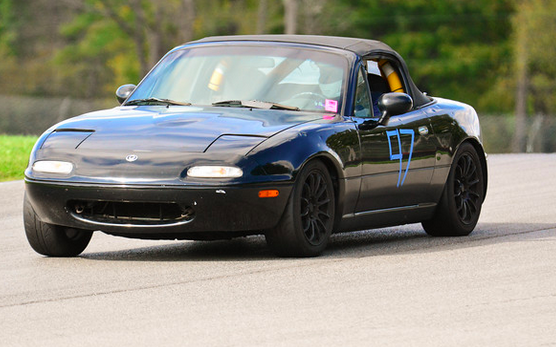 OVR SCCA Forum > Club Life > Ads > FS: 1995 Miata w/torsen, rollbar, etc. For sale is our little Miata track rat and summer semi-daily. - Everything on this little car works - electric locks and windows, AC, original radio, etc. - The body appears to be rust free. - Vinyl top has been replaced at some point. No tears or leaks. - Starts right up and runs smooth. A little ticking on occasion, but usually goes away under load. Typical. - Cheapo Megan Racing Coilovers. Fairly comfortable though, and always handles great on track. - Most of the belts and hoses have been replaced in the past year or so. - REBUILT TITLE - Due to hail damage. There is visible hail damage to the fenders, doors, and rear quarters. I think the hood and trunk were replaced at some point. Point is, this is a driver, not a car show queen. However, I do have two new front fenders that go with the car. Driver and passenger, black, still in boxes. - There is a clunk in the front end when steering. I hunted around for the cause last year, but was unable to find the issue. There is a loose from end link, but I'm not certain that is the cause. - There is a smell coming from the center console/shifter/transmission area after driving for a bit. I replaced both rubber shifter boots (but not the outer leather boot), as well as replaced the shifter oil. The smell was still there when I put it in the garage last fall. 3 sets of wheels and tires. Some or all can be negotiated in with the deal. - 15x6.5 Gold Konig Feather Weight w/All Season tires. Half tread or so left. - 15x7 Black König Dial In flow formed wheels with Direzza ZII tires. A track day or so left in them. - 15x8 Gunmetal/Gray Kosei K1 w/RS3s. No life left in the tires. $3,400 w/one set on wheels. $3,700 with all wheels. Or if you don't like those prices, make an offer! Re: FS: 1995 Miata w/torsen, rollbar, etc. Seems like a fair price for something you can flog and not worry about. GLWS! Update: the smell is gone. It was a plastic bag that had gotten stuck to the exahust, and was melting and making a smell. I was able to tighten the front sway bar end link, but there is still a clunk when turning. Not sure if I’ll make time to continue to hunt it down or not. $3,200 with one set of wheels, $3,400 with both. Was able to get the end link tighten with new hardware. Front end clunk is still there. Tie rod end maybe? Can you make the entire car be about 10% bigger with about 50% more HP? If so, I *might* be interested.